Your invited to a dinner or have company coming and your pressed for time…what to do? You could stop by the deli or get a take out pizza, but this salad will be the hit of the party. It’s healthy, beautiful, fresh, crunchy and savory all in one bite. I originally took a very large beautiful bowl of Sushi Salad to a ladies night out…it was the first dish to disappear, and I didn’t get any! What was left? A counter of foods I don’t eat. So I advise portion some out for yourself before putting it out. Healthy Fast Food for that special event…here’s the plan…. Grab a beautiful serving bowl and a set of tongs before you leave home. Stop by the grocery and pick up the already prepared ingredients. If you have time, make the salad dressing at home. If not, your grocery store will likely have an organic orange ginger vinaigrette Annie’s Organics has a great sesame ginger vinaigrette. If you purchase a dressing you can add some orange juice for an extra kick of flavor. Make your own Orange Ginger Vinaigrette. Sushi Salad is beautiful in a large bowl on the dinner table or individually plated.Talk about easy! Take a picture of this recipe so you’ll have it on your phone when you are at the store. 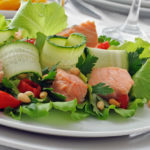 Sushi Salad and other proven recipes can be found in our recipe and healthy living primer, Wonderfully Well. A box or bag of organic greens, a nice firm but ripe avocado, precooked wild caught salmon or smoked salmon from the Pacific Northwest (not farmed), an organic cucumber and some sliced or chopped red onion and your dressing. You can find ALL these in the produce and deli sections at your at most local grocery chains…well except possibly Pigglywiggly, lol. Add some crunch with a batch of Crunchy Quinoa to drizzle on top or even just a package of roasted pepitas. Add a Sushi Flavor, pick up some Nori chips or wraps, break them up and toss with the salad. Anni Chunn has a tasty rice cracker Nori Chip. Note: Some products listed in this post are affiliate links. If you purchase through the link I will receive a very small commission. This recipe is for 4 adults. Adjust ingredients for how many you will feed. Reserve a few slices of cucumber, avocado and onion for garnish on the top. Toss greens and remaining veggies in 1/4 cup Orange Ginger Vinaigrette dressing and top with salmon and avocado. 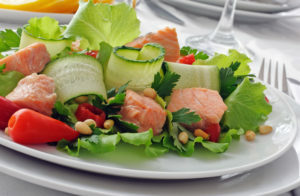 To make it beautiful, toss greens just before serving and arrange cucumber, onion, avocado and salmon on top. Make it better...top with Crunchy Quinoa. 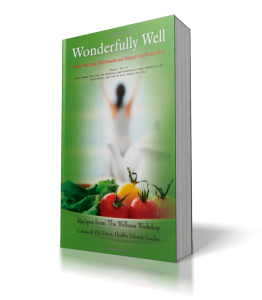 The Wellness Workshop does not diagnose, treat or cure disease or physical complaints. This program is for informational and entertainment purposes only. The Wellness Workshop, Phil and Celeste Davis and their constituents are not responsible for any results good or bad. Use of any or all information from The Wellness Workshop, Phil and Celeste Davis or their constituents or recommended products constitutes user accepts full responsibility for dissemination of information and results. Always consult a licensed healthcare provider in all matters pertaining to your physical and mental health.